Another visit to Sydney has had me photographing plants around the streets. I've barely been in my garden this week, and a walk around it upon my return revealed a lot of work to be done, but it's going to be very hot this weekend, and so unless I get out of bed very early and into the garden, I can't see much being achieved. So I'm going to be posting some Sydney blooms this week and two photos from the garden. Don't forget to pop over to The Propagator for a look at other Six on Saturday posts and beautiful photos of what people are doing and growing in their gardens. 1. 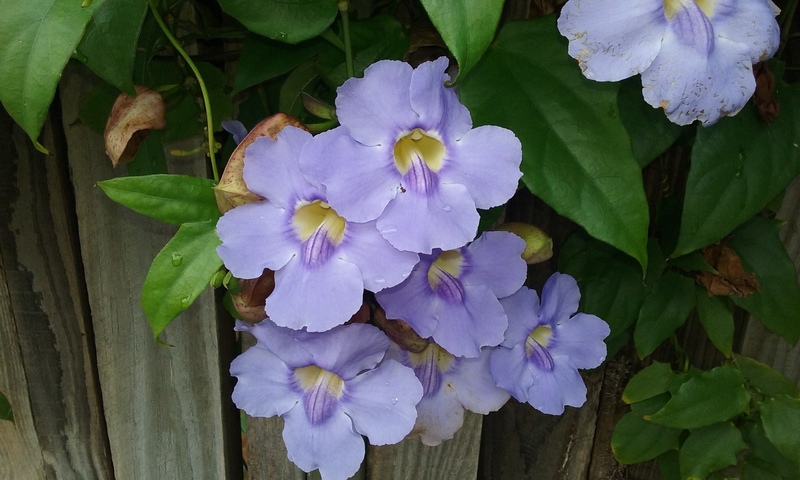 Thunbergia laurifolia. It looked very fetching near a purple tibouchina. 2. Grevillea, possibly Cooroora cascade, leaning over someone's fence from a sinuous trunk. 3. 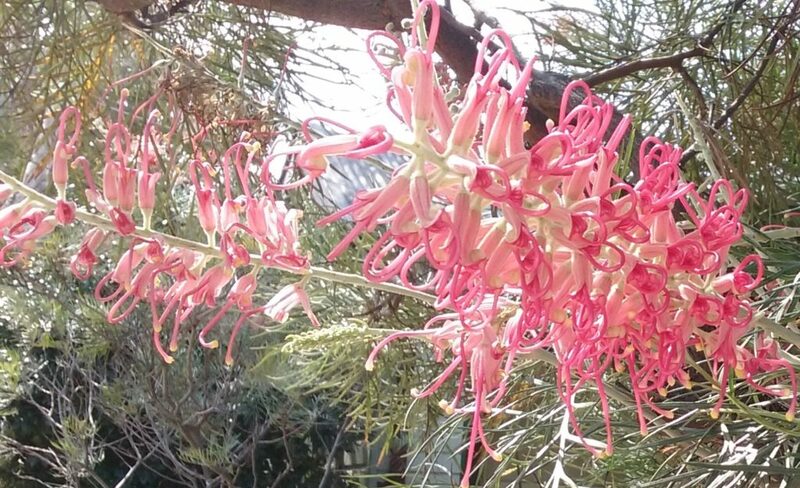 Another Grevillea, 'Coconut Ice'. 4. 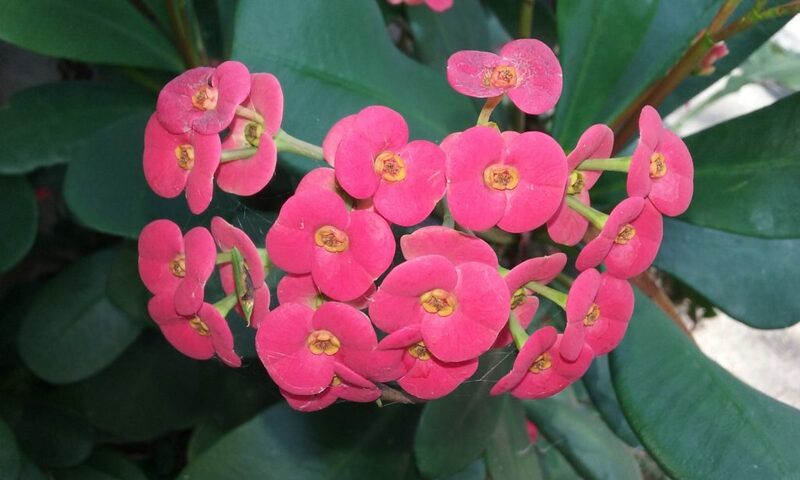 Euphorbia milii, 'Crown of Thorns'. 5. A different garden view- not much shade in my young garden. Hi Jane, I lived in Sydney for three years, so this really took me back! 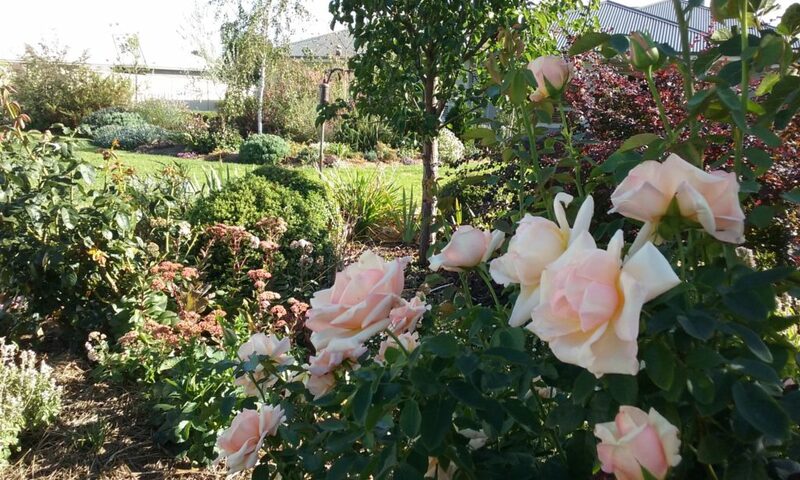 I used to love going for an early walk around the neighbourhood and admiring the wonderful gardens. It took me ages to learn the name of tibouchina – I had to think ‘cappucino’ in order to remember it! Hi Ali, I’m glad to remind you of happy times. Tibouchina is a beautiful tree (it used to be called Lasiandra, but I don’t know why it was changed). In the Blue Mountains on the way to Katoomba, a pink one and a purple one stand side by side and look magnificent. I’ve always liked pink and purple together! 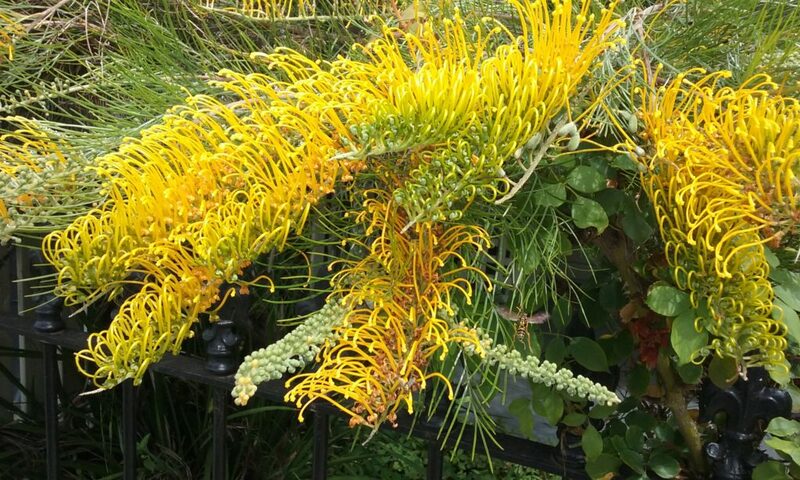 Wow that grevillea! I really like both of them! I have never seen that plant before! Thank you. Grevilleas are beautiful hardy plants with flowers in a huge range of colours and shapes. So lovely to see some blue sky and bright colours. Very grey, cold and dull here. Brown is the dominant colour…! Your pictures are like opening a chocolate box! Just one degree in the south east of the uk today so great to see some summer colour! Thank you Ciar. We’re having a bit too much summer, even though it’s officially Autumn! What wonderful photographs of gorgeous blooms. I specially love the grevilleas. Such a cheery sight on a cold winter’s day. Thanks Chloris. Grevilleas are great plants for hot dry conditions and seem to just get brighter the more sun there is! I’m another vote for both the grevillea but also am impressed by the arum pictum – does it have a scent? And of course, you can’t beat a rose in bloom. Owing to an accident I had some years ago when I fell and hit my face, I have no sense of smell, a terrible thing for a gardener. So I got He With The Nose to go out and have a sniff. He tells me, no discernible smell. 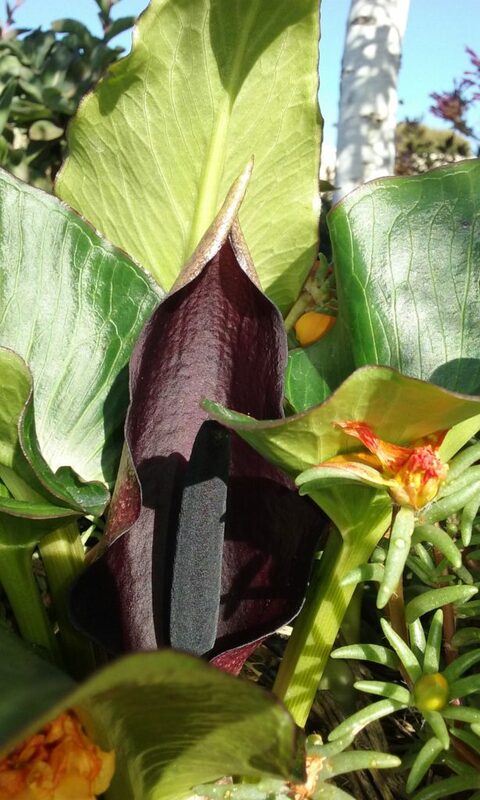 So Arum Pictum must be all for show. Thank you A.JoAnn, my pleasure entirely! That Thunbergia would indeed be stunning with a purple Tibouchina – now that you’ve put the idea in my head I’m probably going to drive myself crazy hunting down a local source for that Thunbergia. I love the 2 new-to-me Grevilleas as well. I took a photo of the thunbergia and tibouchina together but it was too blurry to post. Obviously I have to learn to take more than one photo! Btw I think thunbergia can be an awful weed if not controlled. Love those Grevilleas – the two of them are similar and yet so different. I hope you will post photos of tibouchina – they are so beautiful. We see them blooming in public gardens here (Victoria, BC, Canada), but they are spirited off to greenhouses in the winter. I’ve lost count of the ones I’ve loved and lost – I finally gave up on trying to grow them in our climate. It’s not fair to the tibouchinas or to me.